We continue our Presidential Geography series, a one-by-one examination of each state’s political landscape and how it’s changing. Here is a look at Vermont, the Green Mountain State. FiveThirtyEight spoke with Bertram Johnson, an associate professor of political science at Middlebury College, and Garrison Nelson, a professor of political science at the University of Vermont. Vermont is a quirky state, politically speaking. It was President Obama’s second-best state in 2008, behind only his home-state of Hawaii. But Vermont is also the most rural state and the second whitest, normally strong predictors of Republican leanings. Moreover, Vermont was once among the most reliably Republican states. It favored the G.O.P. presidential candidate in every election from 1856 to 1960, the longest one-party streak of any state, Mr. Nelson said. Vermont elected all Republican governors from 1854 to 1963. 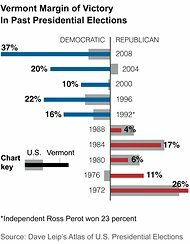 Vermont’s political landscape began to change in the 1960s and 1970s. City dwellers from nearby states like Massachusetts and New York began fleeing struggling metropolises like Boston and New York City. Heading north, these migrants had a choice of where to settle, and some self-sorting took place. More conservatives tended to choose New Hampshire, attracted to its low taxes and “Live Free or Die” ethos. Vermont, where cows outnumbered people before 1963, tended to attract young, left-leaning and outdoors-loving professionals, both Mr. Nelson and Mr. Johnson said. The overall effect on both states was to make them more politically competitive. In Vermont, the state’s first Democratic governor in over 100 years, Philip H. Hoff, who served from 1963-69, helped his party to maker further gains, Mr. Nelson said. (Vermont would take a little longer to elect Democrats in presidential races). In 1970, as the migration into Vermont got going, the state passed a law, Act 250 (PDF), to limit development. That, in turn, attracted more environmental-minded migrants. 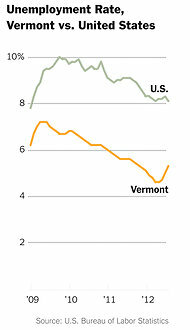 Vermont’s population had been stagnant for decades, but with the influx of “new Vermonters” the state began to grow. When the migration began, Vermont’s population was below 400,000, small enough so that an influx of people could really affect the state’s politics. More than 625,000 people live in Vermont today, and residents born elsewhere are part of the state’s fabric. Vermont’s current governor, Peter Shumlin, is the first native governor in almost 40 years. The newcomers “changed the state,” Mr. Nelson said. Vermont today is among the greenest states, and green industries are a major part of the state’s economy. But the “old” Vermont never really went away. There’s now something of a split between new, highly educated and left-leaning Vermonters and old, less-educated and more fiscally conservative Vermonters. 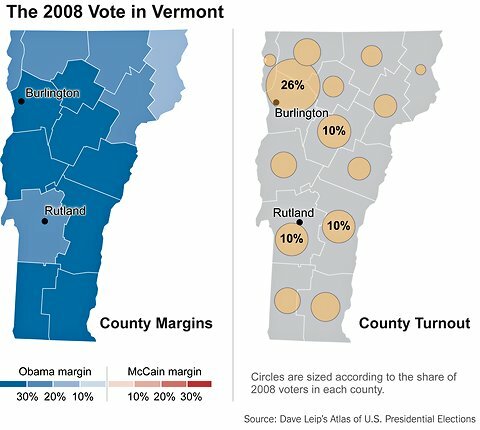 In presidential elections, there is only a little regional variation in how Vermont votes. Like elsewhere in New England and the Northeast, Republican voters in Vermont tend to be socially moderate, and they have little affection for national Republicans. Mr. Obama won every county in 2008, all but one of them with at least 60 percent of the vote. He also won 247 out of the state’s 251 cities and towns, according to the Almanac of American Politics. In state-level races, however, Republican candidates can still compete under the right circumstances. Vermont had a Republican governor, Jim Douglas, as recently as 2010. In the contest to succeed Mr. Douglas, Republican Brian Dubie lost by two percentage points to Mr. Shumlin. The Democratic strongholds in Vermont start with Burlington in the northwest, Brattleboro in the southeast and Bennington in the southwest, Mr. Johnson said. There’s also smaller pockets of Democratic strength in central Vermont towns like Montpelier. Burlington, the state’s biggest city, has developed a high-tech and green economy. Burlington has also grown increasingly diverse, partly because it’s a Refugee Resettlement city. Republican-leaning areas include Rutland County, the Barre area, some northern suburbs of Burlington and the Northeast Kingdom. The Kingdom, as it is known locally, is the most consistently conservative part of the state. It is made up of the three most northeastern counties: Essex, Caledonia and Orleans. The Kingdom is poorer and less populated than most of Vermont. Essex County is the only county Mr. Obama won in 2008 by less than 20 percentage points. Like clockwork, Windsor County has been just one percentage point more Democratic-leaning than Vermont in each of the last three presidential elections. are conservative. But Woodstock, the county seat (known as a “shire town” in Vermont), is a tourist destination and has attracted more left-leaning new Vermonters. “Windsor in many ways exemplifies the contrast between “old” and “new” Vermont,” Mr. Johnson said. Mr. Obama is a 100 percent favorite in Vermont, according to the current FiveThirtyEight forecast, and it is again projected to be his best state behind Hawaii. Vermont is very likely to remain overwhelmingly blue in presidential elections for the foreseeable future. The real question is whether Republicans will remain competitive in state-level races. States that split tickets are becoming increasingly rare as party politics is nationalized. In Vermont, however, Republicans have a few advantages in remaining relevant. First, although Vermont is liberal, particularly on social issues, it also has substantial strains of libertarianism and fiscal conservatism. Second, there’s no party registration in Vermont, and the state holds open primaries. 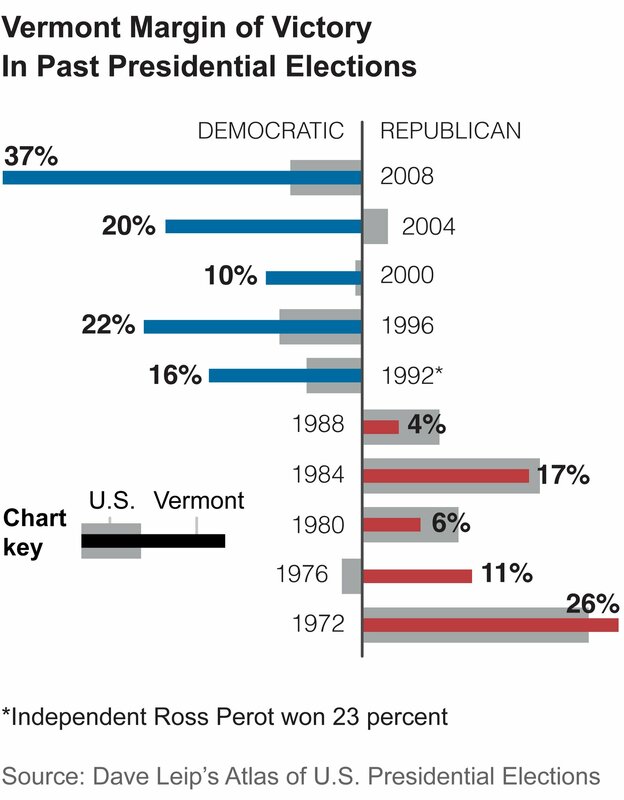 Accordingly, party identification is a weaker bond in Vermont than in many other states. Finally, Vermont is small, in area and population. Retail politicking can swing a lot of voters. “Socially moderate, personable Republican governors can still do well,” Mr. Nelson said. Still, the trend in most other states has been away from ticket splitting, and there is the potential for a “growing and solidifying allegiance to the national Democratic Party” in Vermont, Mr. Johnson said.